The Africa Twin 'Adventure Sports' available in Manual or DCT, offers long-distance riders an ultimately elevated adventure touring experience. A worthy successor to the original and very much the 'Go Anywhere' machine it promises to be. The Africa Twin Adventure Sports' comprehensive abilities start with its engine, which has to perform in off-road situations as well as on-road, over long-range tours, short commutes and all points in between. As such, it provides an optimum balance between power, torque, mass and physical dimension. The four-valve 998cc parallel twin Unicam unit's tractable and usable all-day performance belies its extremely compact dimensions. They are the result of clever packaging touches such as housing the water pump within the clutch casing, and using the engine's balancer shafts to also drive water and oil pumps. As a result, longitudinally, it is the same length as Honda's popular 500cc engine, and its short height contributes to the Africa Twin Adventure Sport's 270mm of ground clearance. The Africa Twin Adventure Sports is available in either DCT or Manual. The unique Dual Clutch Transmission (DCT) features the standard manual mode - allowing the rider to operate gearshifts through triggers on the left handlebar - and two automatic modes. D mode offers the best balance of fuel economy and comfort cruising whilst S mode gives three different, sportier shift patterns to choose from. The DCT is also fully equipped to operate in an off-road environment and the G button enhances off-road functionality. Pushing the G button in any riding mode modifies the control of the clutch system to give a more direct drive. The lightweight six-speed manual gearbox uses the same shift-cam design as found on the CRF450R to ensure positive changes, and is equipped with an aluminium assist slipper clutch. A significant addition to the Africa Twin platform has a Throttle By Wire (TBW) system, which brings with it 3 riding modes to adjust engine character and output to suit riding conditions and an extended range of Honda Selectable Torque Control (HSTC) input. The semi-double cradle steel frame provides the ideal balance of high-speed stability matched to genuine off-road ability by combining sheer strength with flexibility. The engine is mounted on 6 engine hangers, which keeps vibration to a minimum, avoiding the need for steering dampers. A lithium-ion battery saves weight, and the platform's off-road ability and durability. Fully adjustable 45mm Showa inverted forks, fully-adjustable rear shock, dual radial-mount Nissin four-piston brake calipers and 310mm 'wave' style floating discs. The 21-inch front and 18-inch rear spoked wheels are stainless steel. In addition to the standard dual-purpose 90 front/150 rear rubber, block tyres are also approved for fitment. The Africa Twin 'Adventure Sports' is obviously taller, with a flatter seat profile and more upright riding position. The fairing and screen offer more wind protection and a large sump guard and side pipe fully protect the machine. An extra 5.4L fuel capacity compared to the Standard Africa Twin extends range, while heated grips and a charging socket add comfort and convenience. Stainless steel spokes offer durability and ease of care. Dual LED headlights maintain the original Africa Twin's presence and the seat height adjusts 20mm from the 900mm to 920mm (both respectively 50mm higher than the standard model). 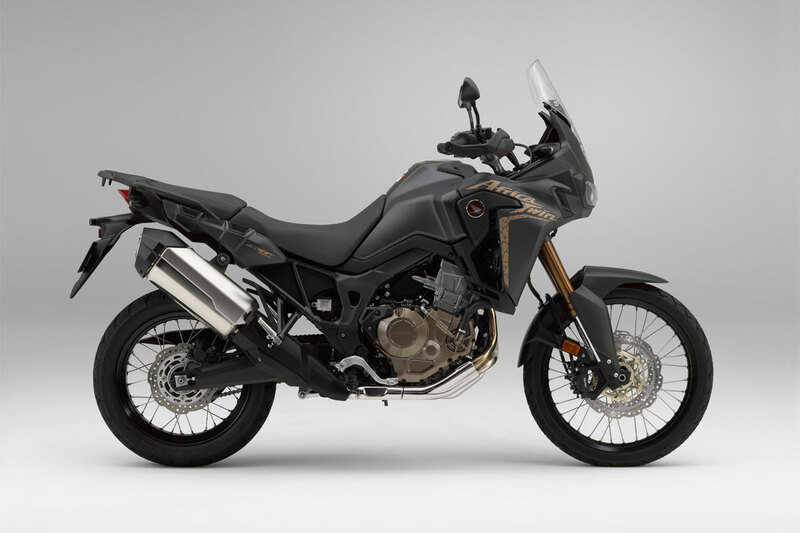 The 2019 Africa Twin 'Adventure Sports' will be available in Pearl Glare White (Tri-Colour) and Digital Silver Metallic. Overseas models shown for illustrative purposes, accessories not included. 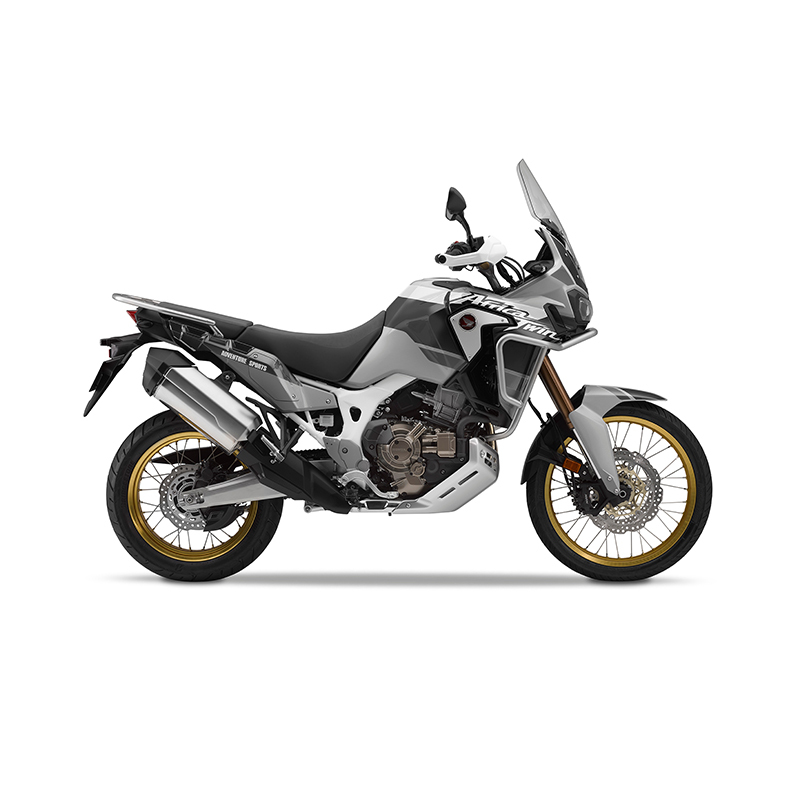 The 2019 Africa Twin Adventure Sports models are available in two colour options: Pearl Glare White (Tri-colour) or Digital Silver Metallic.